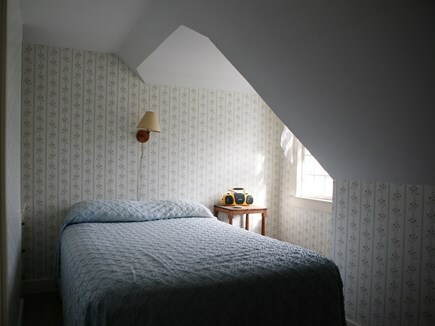 2nd floor bedroom with double and one twin. Nantucket Sound view. 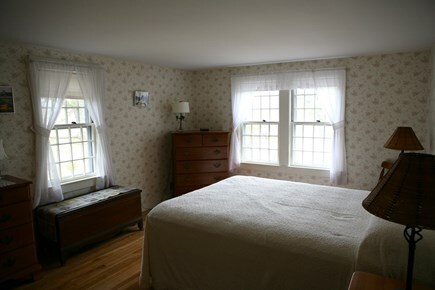 2nd floor double bedroom with Nantucket Sound view. 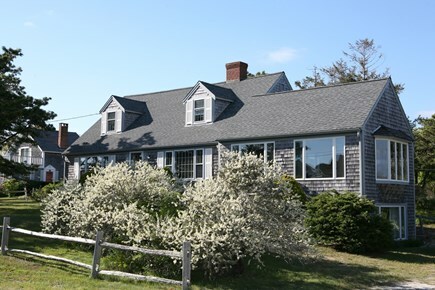 This well-maintained Cape house, situated along the banks of the beautiful Herring River with easy access to Nantucket Sound, is ideal for those seeking a quintessential Cape Cod vacation. 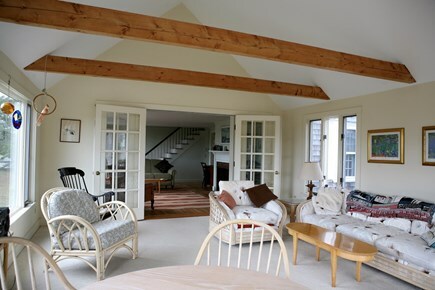 This home is South of the Lower County Road Bridge, offering sailors and boaters safe harbor and quick access to Nantucket Sound. Two kayaks are available for tenant use. 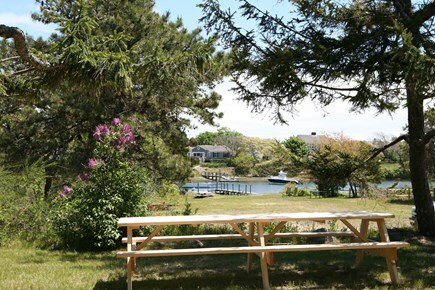 The unique private waterfront property, comprised of two lots, has been owned by one Massachusetts family for 65 years. It is particularly suited for those who love the outdoors. Enjoy fishing, boating and kayaking from the private beach and dock. Swim in the warm, clean salt river water and don't forget your fishing rods and hand nets if you like blue crabs! 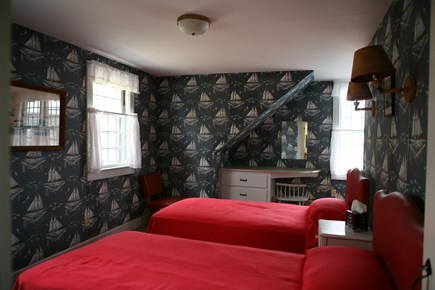 The classic Cape sleeps nine, with one bedroom on the first floor and three on the second floor. The interior features a central living room that opens to a cheerful sun-room offering wonderful water views. 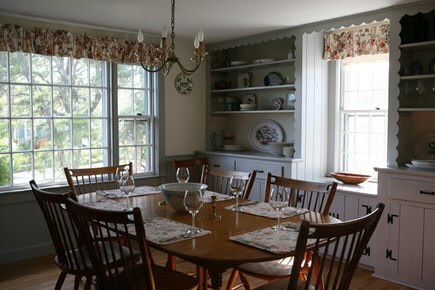 The kitchen looks into a formal dining room. Outside, there is an expansive safe yard for playing and picnicking and an outdoor shower. There is ample parking for house residents and their guests—and even space for your boat trailer, if you have one. The property is in close proximity to Belmont Beach (0.5 mile), Pleasant Road Beach (0.7 mile) and bike trails, in addition to Harwich Port shopping and dining and Dennisport shopping and kids’ activities such as mini-golf, bumper boats, batting cage and go-carts. Additional pricing info: Cleaning Fee: $200.00; Security Deposit: $500.00; Applicable state and local taxes, State and local taxes of 12.45% will apply. 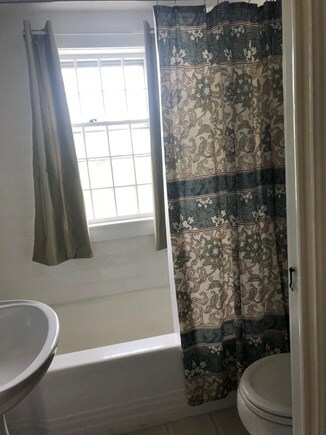 First floor bedroom and bath. Good handrails on entry stairs. Outdoor seating with water views steps from back door. This was our third year at this property and it just keeps getting better. Once a year, our family gathers from different parts of the country so this week is very special. 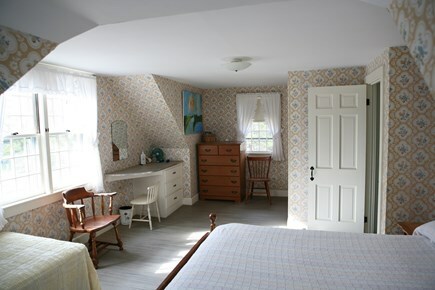 The house accommodates us perfectly with enough beds and social areas. The living room can be used by the adults while the kids are playing in the sun room. And meals happen around the large dining table or outside at the picnic table. But the most loved area is the dock. Everyone gathers there - in the early morning for coffee then later for swimming and fishing. Pleasant beach is really within walking distance - our favorite beach. Beach in the morning, jumping off the dock in the afternoon. It really is what makes this property so special to us. Everything we need is there and the house is spotless when we arrive. There is enough space so people can have some privacy- we never feel that we are on top of each other. Our home on Trinity Cove has been our family vacation spot since 1953. 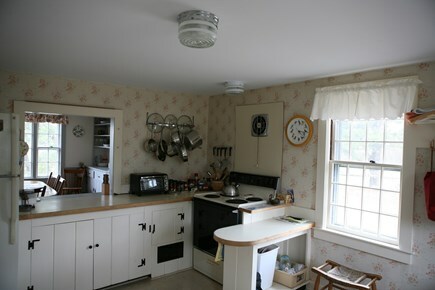 The home is owned by four siblings who grew up experiencing what we have come to know as the ''real Cape Cod'' on Herring River. 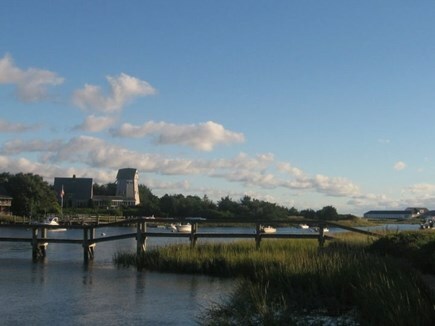 This is a magical spot, away from the commercial strips and distinguished by its waterfront location on a salt water tidal river that provides safe anchorage, swimming, fishing, birding and more. 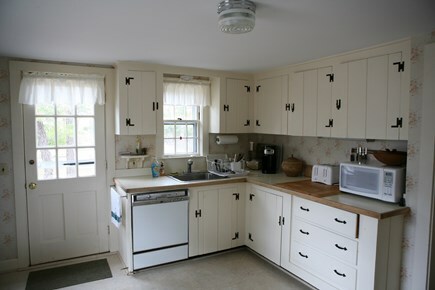 The house has had a number of renovations and updates but maintains the charm of a Cape Cod home. 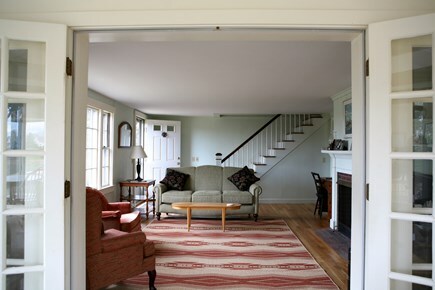 Three of the siblings maintain year round homes in Harwich, Brewster and Orleans. 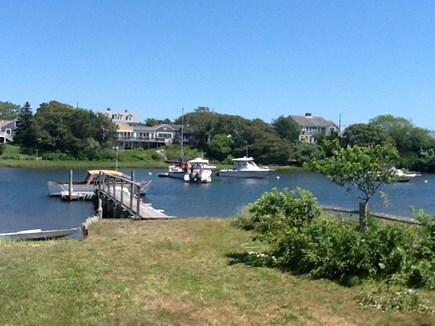 This property is a large two lot location situated on the Herring River south of the Lower Country Road bridge and minutes from Nantucket sound. 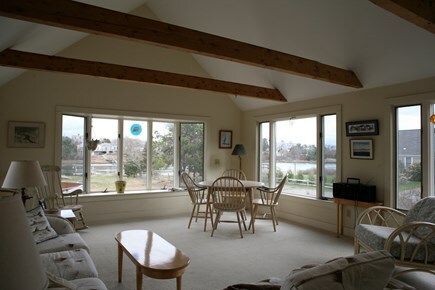 There are water views of the sound and river from most of the windows. It is one of the only properties on the river with a sandy beach that provides safe swimming for children of all ages. There is an outside fire pit where four generations of our family have enjoyed grilling and evenings around the fire. There is also a picnic area and gas grill for those who prefer an easy meal. 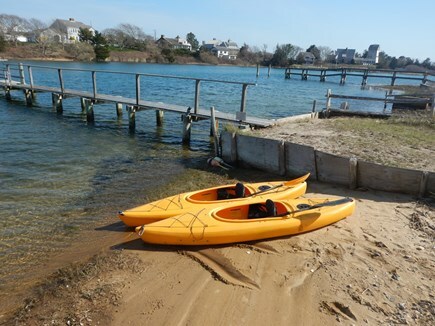 We have two kayaks for guest use and boaters have access to the dock and float. Harwich is a fantastic town that offers historic villages and Nantucket Sound beaches as well as fresh water ponds for swimming. Enjoy the unique Wednesday night summer strolls with open shops, wonderful food and different music venues in various locations along Main Street in Harwichport.